We are only a few days away from December and Christmas time! With the beginning of the holiday season, Schertle and McElmurry's charming children's book is perfect for young children learning to count from one to five! Blue is in charge of delivering five Christmas trees from Toad's Tree farm to the various animals around the neighborhood. 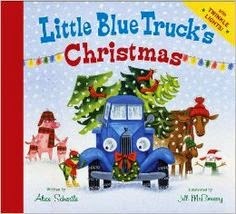 Along the way, the seasonally decorated Blue Truck must deliver a tree to a goose, a cow, a pig, a goat, and the last tree is saved for Blue himself. As Blue makes his way to each animal friend, the reader can count along from five to one, easily learning the first basic set numbers. After counting down from five, Blue arrives home with the very last tree, which, as children open the page, twinkles with actual lights! The lighted tree is the perfect, colorful ending to McElmurry's lovable illustrations. Though a little short, perhaps to give room for the twinkling tree, the story is captivating enough for young children to interact and enjoy.